Identity thieves are phishing and pilfering your personally identifiable information (PII). Identity fraud reached a record high in 2017 with 16.7 million U.S. victims (an increase of 8 percent over 2016) and $16.8 billion dollars stolen. What can you do to safeguard your PII in 2018? Let’s take a look at three methods criminals are using to steal identities. Apple IDs are the #1 target for credential theft emails. If you are one of the estimated 85.8 million Americans who are iPhone owners, thieves have you in their sights. When you consider that most Apple IDs are connected to a credit or debit card, keeping them secure is as important as protecting your wallet. With a stolen Apple ID a criminal can access the linked iCloud account with the potential for identity theft. This phishing email for Apple IDs was seen making the rounds in February, 2018. 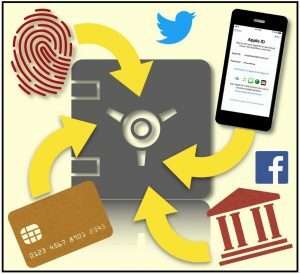 Nearly half of all Americans had their PII exposed in the 2017 Equifax breach making them easy targets for identity theft and fraud. Anyone who has ever had credit was affected by this breach. The PII that was stolen, Social Security numbers, date of birth, credit card numbers, driver’s license numbers, and telephones numbers, is precisely the type of information needed to confirm identity for various types of applications. Unfortunately, financial damage has already started for some of the data breach victims. In a recently filed class action suit, thieves have allegedly used the stolen PII to apply for mortgages, student loans, and credit cards. It’s estimated that globally there are 2.62 billion social media users. Criminals quickly jumped into the world of online identity theft on social networks (social identity theft). Stolen identities; names, photos, and personal information provide the raw material for bots or automated accounts, blurring the lines between what’s real and fake. As reported by The New York Times, an American company named Devumi, collected millions of dollars in a murky global marketplace for social media fraud by selling Twitter followers and retweets to celebrities and businesses. Social identity theft is also making headlines in the world of politics. French President, Emmanuel Macron, allegedly had his online identity stolen during the 2017 presidential election. Cyber espionage groups and state sponsored hackers are also deeply involved in social identity theft for the purpose of reconnaissance and phishing. However, social identity theft is not just limited to the world of spies, espionage, politicians and celebrities. Consider what happen to Alexandre Martinez, a man living in France, who fell victim to an intricate identity theft scheme. Personal information and photos were stolen from his social media account and then used for fake online identities. Alexandre Martinez became well-known in Bulgaria as ‘Alexandre Nicolov’, a “rich and successful manager, landing top jobs at multinational corporations including Airbus”. He had a large online following that included journalists and politicians. Why would a criminal steal Alexandre Martinez’s online identity? The short answer is money. After waiting years for trust to develop with “Alexandre Nicolov’s” online followers the alleged identity thief, initiated a ponzi scheme, offering discounted flights through Facebook. Unfortunately, identity theft and fraud are a fact of life. It’s no longer a question of If but of when. However, there are steps we can take to minimize the risk. The Federal Trade Commission has provided some very useful advice. It really comes down to being vigilant and observant. Know who you share your information with. Store and dispose of your information securely, especially your Social Security number. Ask questions before deciding to share your personal information. You get notice that your information was compromised by a data breach. If you use social networks, it is time-consuming to read and understand privacy settings, as well as how your information can be used. As an example, Facebook’s terms and conditions comprises 14,000 words. But, if you are serious about safeguarding your information, it’s absolutely necessary to become a privacy settings expert. The Identity Theft Resource Center has an excellent fact sheet that explains how social identity theft can happen and how to protect yourself. Being vigilant and observant requires time and effort. However, it’s easier and less stressful than trying to recover from identity theft and fraud. Identity theft is a great concern especially in today’s era. It’s a matter of serious threat when someone is deliberately using someone else’s identity. Identity theft also leaves the victims with grave and irreversible consequences. As also discussed in the article it is also important to be aware of suspicious emails, to protect your social media accounts, and be aware of who has your personal documents. I have read the post and I found it very much helpful becasue it has helped me a lot from being attacked by many phishing attacks. You must also get to about the phishing attack and know the procedure to be safe from it.